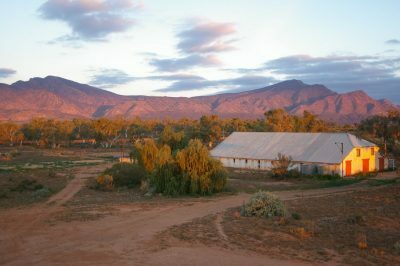 Edeowie is an operating sheep station in the Flinders Ranges area of South Australia located 450 kilometres north of Adelaide. Edeowie is located approximately 56 Kms north of Hawker on the Western side of Wilpena Pound. The world famous and extremely picturesque Flinders Ranges form the Eastern boundary of the property. This makes Edeowie Station the perfect base for your next holiday, with day trips to Wilpena Pound, St Mary Peak, Brachina Gorge, Parachilna Gorge, Leigh Creek and Blinman, or as a stopover as you travel further north. The station abounds with native wildlife and creeks lined with splendid river red gums, an artists, birdwatcher’s and bushwalker’s paradise. Edeowie neighbours the Ikara Flinders Ranges National Park and offers access, via station tracks, to the spectacular Edeowie and Bunyeroo Gorges. Our accommodation includes our historic Shearer’s Quarters; Edeowie House; Old Brachina Hut and great bush camping sites. The Shearer’s Quarters can accommodate up to 20 people, is spacious, well-equipped and comfortable, perfect for families and interest groups. Edeowie House can accommodate up to 6 people offering luxury king sized and queen sized beds. Old Brachina Hut, situated high on the bank of the Brachina Creek, offers spectacular views of the Heysen Range and easy access to Brachina Gorge and Ikara National Park. Our bush camping area near the Edeowie Creek, just 4km off The Outback Highway, offer easy access to shady private sites. Pit toilet and firewood available. All bookings are sole occupancy and we provide firewood for your enjoyment. Enjoy spectacular sunsets, clear starry nights, amazing bird life and relaxing by a campfire. A perfect base for your Flinders holiday. Escape the crowd! Pets, Firearms, Trail bikes or off-road use of vehicles are not allowed on this property.